Its been about 2 1/2 months since we received our kitten Luka from you. As you know, our son Alex is an asthmatic and extremely allergic to cats and dogs. So allergic in fact, that he would have coughing spells along with itchy watery eyes with the neighbors dog if he stood just a few feet away from him. Despite the begging and pleading from our children wanting a cuddly pet to call their own, we pretty much thought we'd have to be a pet-free home due to Alex's intense reaction to virtually any furry animal that he came in contact with. Thankfully, we were introduced to Siberians and to you as a local breeder that would make my children's long time wish of having a pet come to a reality. At the beginning when Luka first came to our family, Alex had some symptoms of itchy eyes and some nasal congestion, however since we have gotten Luka neutered, Alex has been symptom-free and has not had any reactions at all. It's a good thing because we'd be hard pressed to let this kitty go at this point. Words cannot express how amazing Luka is. My husband who has owned cats before even comments how Luka is like no other cat he's ever had, known, or seen. If Siberians are the "dog" of the cat world, then Luka certainly fits this description. These are the top 10 uncharacteristic, characteristics he possess. He's always bright-eyed and ALWAYs ready to greet us. He's waiting by the door as soon as he hears the garage door open from when we've been out, no matter if it was just one of us or all of us coming back home. He follows us from room to room and even seems to understand some complex language. For example, I'd tell the children, time to get ready for bed...and up the stairs Luka goes and enters one of the children's rooms! He plays fetch. He did this just a week after he came to us, retrieving jingle balls as we threw them down our long foyer and bringing them right back to us to throw again. He's quite the scholar as he loves to play with pencils and helps our son with his 3rd grade homework every night (I think it's more of an attention getting scheme, LOL). We recently took him on vacation and he loved the 6 hour car ride, often sitting on the middle console acting as co-pilot to my husband driver, if not sleeping or chilling on my lap as a passenger. He was actually easier than the children during this long trip. He greets visitors to our home, never hides, and loves to be in human company. He enjoys baths. Due to my sons allergies, we initially bathed him every week and now give him one about every 3-4 weeks. He has never struggled to get out of tub or to get away from the water. From bath to blow dry, he's just perfectly behaved. He bears gifts (his favorite toys) every morning in our bedroom. He pretty much turns to a rag doll when the children pick him up and pretty much lets them do anything to him without any aggression what-so-ever. What I am most impressed with however is that having 2 kids ages 5 and 8 who are always so eager to handle, cuddle, and squeeze him, he has never once bit, scratched, or hissed at the children. If I had ever heard anyone say anything like what I have described, I would be in disbelief and would think it would be too good to be true as no cat could possibly be like this. Luka is THIS cat and we are proud to say that we have the most amazing cat ever! If we didn't have the experience of having him, we would never believe it. I'm sure Luka is just one example of the phenomenal job you have done in producing the most sweetest, loving, loyal, gentle, and not to mention most beautiful cats ever! People Ask How Siberians Do With Dogs... Siberians Love Dogs! It's been a almost 6 months since we brought our kitten home. I had to send you a message to express how wonderful our Daisy kitten is. My husband is very allergic to cats, not just a little itchy watery eyes but full-blown airway-closing allergic. He was very skeptical when I told him about your cats. Needless to say, we had to have one. The first month, he sneezed a few times while Daisy dusted our house, but not once had any reaction more severe than a sneeze or two. We are so thankful that your contract does include a return policy, we would not have been able to take that leap without it. And so glad we did not have to use it! She is the most open, playful, and personable cat... unlike any other I've met. My husband loves her and plays with her all the time. I knew they were getting along when he started buying kitty treats and new toys every trip to the store. :) She has great house manners, gets along very well with our dog and LOVES getting into cabinets. And rolls of tape are her favorite to carry around and chew on... wrapping gifts last Christmas was very interesting! The one pics shows her sleeping in the dogs bed while the dog is on the floor, nothing unusual there. :) The other is Christmas morning. Kittens are doing fine! Can't believe how well they're getting along with our dog. Here are a few pics. We are enjoying Samantha immensely! She is a sweet girl and likes everyone and is training the dog on proper kitty etiquette. They have touched noses on their own and the dog is now licking the cat- maternal instincts? Who knows? Went to Petsmart 3x to return stuff and get new stuff because we are learning her likes and dislikes. The cat tree went back- she spends her time on the floor- contrary to what I read about cats. The fancy litter box went back and she uses the one you sent- no problem. We have a larger one as she grows. It's on the 2nd floor though she hasn't used it yet. The scratching post went back and we got the corr. cardboard you sent - one on each floor. She uses that, no problems so far. I have yet to get her to the vet, will make an appt. soon. Here is our kitten... see how big she is getting! 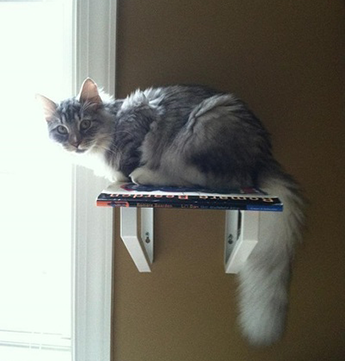 We built three "book shelves" next to the window so she could climb up and watch the birds at the bird feeder! She loves to climb... wow. Came home one Sunday to find she had pulled down the valances in the bedroom. No curtains at the window, just valances... she had to jump vertically several feet to reach them. She has also taken down the valances in the walk-out basement. I am putting in Plantation shutters and that will be the end of the curtain story, lol. She sits on the end of the bed and looks up at the ceiling fan. Then, jumps for it. We have vaulted ceilings and the fan is at least 6 feet up... beyond her reach, but if she ever figures it out, I think she could make it if she jumped from the top of the headboard (sshhhh... don't tell her). We are enjoying her so much and she is a great little friend for our dog. They take turns chasing each other and chewing on each others ears. They play so hard between about 8:30 and 9:30 each night that they sleep well through the night, lol. About spaying her... our vet would not do it till she was 6 months old and that week I was catering and speaking at a ladies luncheon. I want to wait till I can take care of her without distractions. Next week we go to California to meet our new granddaughter (she was due last Saturday and the Dr. says Monday for sure... he will make it happen if she does not come on her own, lol) So, I will schedule Greta's surgery when I get back the first week of November. I just wanted to give you an update. Thank you so much for breeding such wonderful kittens!! My family and I wanted to let you know that Bella is the more than we could have ever asked for. It took her about two weeks to adjust to our home but once adjusted she become a loving part of our everyday lives. Even when company comes over she is very affectionate to them as well. my in-laws brought their dogs over the other night and she spent the night playing with them! She is an absolute pleasure and we thank you from the bottom of our hearts. Just an update on Mikhail. Everyone should know about these cats. I didn't understand when you told me about their personalities. I am 48 years and have had cats (persians, himi's and house cats and dogs all of my life) BUT NON LIKE THIS. This is the most unusual animal I have ever had. He is not like any typical cat or any dog I have ever owned. He truly is in a catagory all of his own. He immediately placed his trust in me!!! I picked Mikhail up yesterday. He layed on the floor like a perfect gentleman for 26 miles or so. I stopped at fast food and got out - he never even tried to bolt from the car. I got back in and he jumped in my lap looking out the window the last 50 miles purring all the way. He kept pressing his body into mine, it was like he wanted to climb inside of me. If he could have gotten closer to me he would have. He was never intimidated at all. All other animals (even if they are friendly) have a period of learning to trust. Not this one, trust is given not earned with these cats. As you know I have a bird, 3 other cats, a very large dog and a small dog. I had to go to work so I put him in my bedroom for the night for some peace and quiet until I could come home. Upon my arrival at home this am I opened the door, he was on my dresser. He tried to jump into my arms, I didn't know what he was doing so he landed on the floor. I picked him up and all I heard was purrrrrrrrring. He came out and immediately the pyrenees (large dog) greated him with curiosity. Immediately Mikhail started to rub against his legs, then reached up and patted him on the nose as if trying to shake hands! He came out and walked all around the house very very mellow. Rubbed on some furniture, saw the little pug and rubbed on her. Saw the other cats and went to greet them - they ran and hid. Then he saw Miah (my female cat). Miah hissed at him and growled. He just looked at her and walked away. His tail throughout all of this was straight in the air. He hasn't jumped on anything. He is not afraid at all. Within 1 hour he had come to me, rolled on his back and wanted a tummy rub. Mikhail is the most awsome animal I have ever encountered. HE IS NOT A CAT, HE IS NOT A DOG, HE IS BOTH AND YET HE IS SOMETHING EVEN MORE. I can say as an experienced animal owner/trainer of many breeds for the past 48 years, that unless someone actually experiences a Siberian they will never understand. Words can't describe these truly majestic animals. I will never have another breed of cat except possibly another Siberian. I used to think my persians were different but they exhibit the typical cat traits. I now regret not knowing about these animals before. Mikhail will be trained up as a therapy cat - going into nursing homes and visiting people with disabilities. Nancy there are not words to describe this cat and I can't even find the words to express the thanks and respect I have for you as a breeder. I will keep you posted on his life. Oh, and by the way I talked to my daugher this am and she may want one next. She also is in health care. Hello, my name is _____________ and I am inquiring about filling out an adoption exploration form. My friend, _________________ has three of your lovely siberians and I love each and everyone of them. I was so jealous that she could have these beautiful cats, because I am severely allergic I couldn't have owned one I thought. But then she told me they're hypoallergenic and for me to come over and meet them and see for myself, I couldn't believe it. So I took all the precautionary measures I would usually take for say I visited a friend or relative with a cat, which is emergency allergy medicine. I gave her the benefit of the doubt and didn't take it before I got there. (And remember there are three of them.) I walked in and held each and every one of them. Not a single sneeze or itch, my eyes were not watering nor burning or even the slightest bit itchy. I thought of it as a true miracle. I have wanted a cat since my early childhood and my mother always had to explain to me that I would never get to have one. It broke my heart. And I had lost hope until now. I would really love to own one of these precious darlings. Thank you so much for your time, and I hope to hear from you soon. I hope this email finds you doing well - we check your website often to stay updated, as well as to see all of your beautiful new kittens. 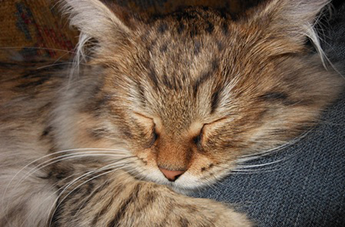 We got 'Sidney' from you in March 2010 - she was the kitten from Rossity Uliana's litter. 'Sidney' is so loving and playful. Always into mischief, but such a cuddlebug! She and Jasmine (Faina's 2/23/09 litter) are the best of friends. They play together, groom each other, and often curl up together to sleep. We couldn't have asked for better kitties. They always greet us at the door, and follow us everywhere. One of Jasmine's favorite things to do is jump in the clothes basket for a ride - the kids push her all over the house, and she absolutely loves it! Every time she see's the clothes basket she's waiting for a ride! Both of the cats LOVE water. As soon as I turn the bath water on for the kids at night, both cats are sitting on the side of the tub swatting at the water coming out of the faucet. Many times they've taken a tumble into the water - they just love it! One more thing I wanted to share with you about Jasmine - she's come to recognize our son's alarm clock in the morning. As soon as it starts going off, no matter what she's doing, she's stampeding to his room to jump in his bed and wake him up! I would have never expected that behavior from a cat - as you told us, they think they're dogs, and we absolutely adore them! We wanted to let you know that we have fallen in love with Meow Miser and it has just been one day! He is an awesome cat – he’s very skittish right now, but we expected that. HOWEVER, he has begun to feel more comfortable with us and when he comes out of his shell, he is THE most affectionate cat in the world. He has such a great spirit about him too and we want to thank you for raising such a wonderful cat. Please tell your daughter that we understand that she is missing him and that we are taking great care of him. We will be sure to send you updates and pictures so that you can see how well he is doing. We are pretty sure that we want to call him Misha (Michael in Russian) – which happens to be very close in sound to Meow Miser. Right now, we’re calling him Misha Meow Miser! We adore him and can’t wait for him to assimilate fully into our household. 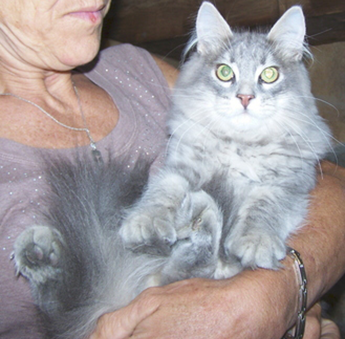 We hope to introduce Ulia (our current Siberian) to Misha this weekend. I think they are going to get along very well. Thank you for sending along all the cat toys and food, etc. He already has been playing with the fish on the string and the furry rat (ick!). He’s eating and using the litter box too. He still is hiding, but I would expect that because he’s in a completely new home with people he doesn’t know. We are spending lots of time with him. He was chasing his toys and laser light. Elizaveta (whom we renamed Hana) is now purring in my arms, distracting me from typing. She is a very lovable kitten and our relationship is developing and growing every day. At first Hana didn't sleep with us, but now she really enjoys sleeping on our legs and staying in our laps. She is also a "demanding lover", enjoys her cuddling sessions and likes to follow us around the house. She is getting along very well with our other cat, who is now also more happy and lovey. As promised previously, I attached some recent pictures of her in her new home. As you can see from one of the pictures, we even got her a basket, since she seems to enjoy them so much. You can probably guess that we are just totally in love with Alani. She's beautiful, fun and so sweet. She's in the habit of getting brushed in the morning. She gets so excited about it and loves the attention. Then we have some play time. One weekend morning I decided is was just brush time and I went back up to lie in bed longer and drink coffee, watch news. We had to turn down the TV to hear what she'd gotten into. I had left the drawer open where her toys are and she had found one and dragged it up stairs. The stick (fishing pole) part of it clanking on the stairs behind her along the way. Hopped right into bed with it in her mouth. She was ready to play. What was I doing? Too flipping funny! I think I already told you how she loves bird feathers. Let alone playing with and chewing on them, If we leave them out she'll bring them up one by one to our pillows in the night. An offering I guess? I'm dying to get a picture of her with one in her mouth. Sooo cute! And she loves water. I leave out and refresh twice a day for her a glass of water but that's no interest. Tub, sinks any running water and she's there. I can hear her downstars right now going nuts in some paper bags and her ball in the circle toy thing. Cracking me up. Nap time in a drawer or a sunny spot must be around the corner. Thank you for such a wonderful kitty. Interesting for me to have a bred cat and see how all the care and handling you have done shows through in her. She's fanatastic. Lover Boy is doing very well. Yesterday, he was quiet throughout the trip home. We placed him in our bedroom with the Master Bath and closed the door to the hall. He initially stayed in his carrier and we left him alone in the room. Later, we came back and he was under the bed. Last night he mewed for an hour or so after we went to bed. We knew he was missing all his kitty relatives and you. He was under the bed and we were just above in the bed. He moved around in the night and he ate some of the food you sent. All day today we periodically visited, but he stayed under the bed. We were waiting for him to come to us. This afternoon Ray felt he was wanting to come to him for affection. Ray was calling and he squirmed, but held back. This evening at 8 p.m. his desire for affection won out. I was in the room sitting on the chair and he came out from under the bed. He ran up to me. I rubbed his ears and before I knew it he was on my lap....drinking up the affection. I am so pleased he has begun to trust us so soon. I was thinking it might be two or three days. He is such a sweet little guy. I really like him. He has been on Ray's lap and even on my sister's lap. He has been eating well and using the litter box, which we filled with the litter you sent with us. I suspect when we go to bed tonight he will be up on the bed with us. Thank you again for the adorable little guy. He is a real sweetie. Well, I've had Joshua for 2 weeks - he is a real joy! He likes to sleep under the couch for his naps but otherwise the whole house is his domain. He loves breakfast best. He meows constantly in the morning until her gets his 1/2 can of classic fancy feast. I've introduce the EVO dried food with the kitten food you gave me - he eats both. Two days ago his Drinkwell platinum pet fountain arrived. They said it may be several days before he uses it. Five minutes after it was running he was drinking from it and playing with the water stream. After a rocky start, things are WONDERFUL! The first 5 days were touch and go for sure; on the 6th day, late in the evening, she finally ate something. I enticed her with some wet cat food, she then threw it up in the night, but it must have gotten her juices flowing because the next morning, she started eating! She drank water all along but she refused to eat until that 6th day. She spent the first two days hiding under an armoire in my son's room. He woke us up on the 3rd night at 4:30am to tell us she was out, up on his bed, and purring!! We were all so thrilled - I was worried she wouldn't adapt. All three of us then had an impromptu petting/purring/playing session in the hallway. But it is JUST like you said - she adapted to us first and then gradually she's getting used to her quiet surroundings. She is absolutely amazing and we ALL love her, even my husband, the guy who is allergic! She sleeps on my son's bed at night and hangs with me during the day; she LOVES to knead bread, as you said she did, and likes lounging in laps and hanging out on the wooden tops to the radiators, which are placed right under windows overlooking the streets. I think she's already losing weight although it's hard to tell under all that fur. :) She's transitioning well to the 'diet' cat food and will be done in another week with the higher fat kitten food. No raw stuff though - ! :) We are absolutely in LOVE with the Siberian breed because of Faina! I hope we have many more years with her in our family. Little Miss Molly Formerly "Foxy"
Adopted at the age of 6 1/2 mos. As an extreme skeptic, I felt the least I could do is offer a testimonial about these incredible cats. I've owned cats my whole life, but when our daughter was 2 we were forced to give our 2 cats to grandma because of her allergies. I thought our chances of a family pet were zero. Both of my kids are allergic to dogs, and my daughter to cats. After much research into the siberian breed, I contacted Nancy who invited us to visit her cattery. My husband and I both were convinced this was not going to work out due to the severity of her allergies, but felt we owed it to her to at least try. A beautiful little mack tabby introduced herself, and Nancy was kind enough to let us take her home to see how my now 7 year old daughter would react. (She even made sure to tell my daughter,"This is my kitty I'm letting you borrow, so you have to bring her back"...just in case it didn't work out). On day one, this little girl made herself right at home, and continues to amaze me with her incredible intellegence, sweetness, intuition, trust, beauty and gentleness. As a lifelong cat owner, I have never had a cat like this...you really must see these animals. They are truly unique in personality and have a wonderful disposition. As I am sure you have already guessed....Molly never did go back. We are all completely in love. So if you are sitting there thinking, "yeah, right" or "I wish", just like I was...go and see for yourself. Hearing my daughter whisper,"you are my best friend and a dream come true" to this little cat was worth every penny, and the companionship of owning a pet when it was previously impossible is priceless. So from my family, I thank you for letting Molly adpot us, and encourage anyone who is thinking "I can't ever have a cat due to allergies" to think again. It's worth it. Carrie Jim Kaelyn and Tommy K. and Molly too. Last Christmas, I purchased my cat, Dimitri Ruslanov "Dima" from you. He was part of your July 5, 2007 Ruslan and Dominica litter. I met you at the airport to pick him up so he would be a surprise for my kids. I cannot tell you how much I love this little guy. He is CONSTANTLY with me. He has never meowed, has never hissed, and does not scratch anything. He purrs constantly and chirps at me when he wants my attention. He is the most sweet and loving little guy. He is so hearty and not at all jumpy the way most cats are. Plus, he is so funny and playful. Unfortunately, his favorite play time is around 3:00 AM when he jumps around our bed and pesters the heck out of me to play fetch with him with these fluffly little balls he loves. He is relentless!! Honestly though, I am a dog person and never thought I could become so attached to a cat. Further, I never thought in a million years that I would take this cat over a dog any day. He is the perfect pet in every way. My kids and husband agree!! Alex and Nicky are great! We are so happy with them. They both are very affectionate and smart. They are so aware of you and want to be with you. I can't say enough good things about them and how much we love them. They also are very close to each other. They love to play together and cuddle together, which leads to them washing each other, which then leads to play time lol. It is so cute watching them together. When I come home, they run and meet me. It's funny, one will run over to the scratching post as if to say "look at me. See what a good boy I am." So then the other one goes over and does it too. Alex loves to play fetch. And I never had to teach him, it is just amazing. I have 5 other cats, but something about this breed is special. They are always in a good mood and happy to see you and they never fail to put a smile on your face. I've attached a couple of pics as I know you were interested in seeing how Alex turned out. Thanks for raising such wonderful kittens and bringing them into our lives. I am the guy who picked up Zoe, kids named her, at the airport around December 23, 2007. What a cat. She has quickly become the favorite pet of the house. We love the sounds she makes (really loud purring and chirping) and the fact that she always wants to be around people. My kids and even the dog loves her. She really has an unbelievable personality. The best thing is that my allergies are fine. She fetches and we never trained her to do it. I really can't say enough about what an important addition she has made to our family. She has grown a lot and when people see her they always comment on her beauty. But as I said before, her personality is what really makes her special. Thanks again for meeting me at the airport. This link is of some goofy video I took of her today. I may call you one of these days to maybe purchase another cat. Erik is doing great and I thought I would let you know that if you need any type of testimony on the siberian breed and the hypoallergenic part, I would be more than happy to do it. My daughter Danyela (10 yrs) is allergic to cats with a rating of 3/4 and her mucus development of 4/4 and she also has asthma (she almost died twice at age 3 and 4). She was able to to around cats, but was never able to pet them or hug them. If she were to touch them or be in contact with their hair, she would get hives and have an asthma attack.....This was so upsetting to her due to the fact that she loves...I mean loves cats. When Erik arrived she cuddled him, petted him and hugged him everyday. And guess what....no reaction....both Danyela and Erik are in heaven with each other and Danyela says that this is a miracle. I am so happy that she can now give all that love to Erik and he loves it. Ps I got the papers in the mail yesterday. Thank you. Just wanted to let you know how LEO is getting along. HE IS JUST GREAT, THE LOVE OF OUR LIVES, It is amazing after having a welsh corgi for over 15 years, and a anti-cat husband, how quick Leo is my husbands buddy. I will come home from work and he is holding him up over his shoulder like a baby and patting him. He follows me around the house, like a dog and I call him "catdog" occasionally. My husband recently had a difficult surgery and spent 20 days in a rehab.facility and everyday asked about Leo and for me to "kiss him" for me. His therapist, got to see Leo, when I picked my husband up, and Leo , was a true King, he left the girls hold him, cuddle etc.,and purred very loudly. All my family said that if anything would happen to me they would be very happy to take Leo to live with them, strange none of them ask for any of my other possessions, just Leo. I have Alina, an all black female born on 12-23-06. I used to have Eva also. I hope she is doing well. I wanted to send you some pictures of Alina getting in the shower. She is too funny. She gets in the shower with me every morning. I have to towel dry her off when we get out. She has beautiful golden brown colored eyes. Love her. Just wanted to give you a quick update on Boris and forward some pictures. He is doing sooooo well. I have never ever met a cat like him before....He is an absolute hoot. He loves his toys and is constantly sharpening his "killing" and hunting skills. He waits until my poor dog is asleep then jumps on her head. It's crazy...my little 7 lb kitten is completely unafraid of my 106 lb German Shepard..Actually they are great friends, Boris has been excellent for the dog. Fingers crossed...still no allergy problems with my brother. No shedding...no fur all over my black clothes...Yes...I'm in love....You told me they were different. I would never have believed it. I just scheduled his neutering, October 25th and I will send the paperwork soon afterward. It's not a great picture of Boris and Roma - But it gives you a good idea of the size difference, how unafraid Boris is and how happy Roma is. Thanks. I cannot tell you how happy we are with Boris...He is so precious. My brother did the allergy test and NOTHING! We were only hoping for a reduced allergic reaction. I will let you know how this progresses as time goes on. The vet said he is in fantastic health and we will neuter him in mid-October when he is closer to 6 months. Last Saturday he was 2lbs.9oz. He is sleeping through the night...a miracle...a big purr monster....I am in LOVE!!!! I just wanted to drop you a short note and let you know how Nikolay was doing. He is doing GREAT!! He is the sweetest, most affectionate kitty I have ever seen. He and Cooper, our golden retriever are bonding more and more each day. We have re-named Nikolay “Felix Nikolay” and it seems to suit him perfectly. He doesn’t answer to his name yet but we are working on it. The Felix has sentimental value to us and we were thrilled it was one of the Russian names on the list. The cutest thing happened this morning. Cooper was laying on the floor on his belly chewing a bone and Felix was “stalking” around him…watching him real closely. The next thing I know, Felix jumped up on Cooper’s back and sat down…then laid down. Cooper stopped chewing his bone, turned his head around to see what was going on…looked at Felix and you could see in his thoughts on his face “that’s cool” and he went back to chewing his bone. Felix only stayed there a moment or two but it was one of those times I wish I had my camera right there. I think I’ll have to bring it down and have it handy for just such “Kodak moments”. As soon as we have some pictures, I will e-mail them to you. Thank you again for the wonderful experience of purchasing our very first kitty in our 33 years of marriage. You have a wonderful home and it is so obvious your pets are all loved. Thank you for such a delightful kitten. My daughter Bella just loves her to death! She's so sweet. She gets up with us when we get up every morning. She rubs around our feet and asks to be fed. I forgot to ask you what your feeding schedule was but I just leave some in her bowl and let her eat at her leisure. I told my fellow co-worker about her and he's hooked on her breed. I gave him your information he may be calling you. We just are so very happy with her. She is my daughter's best little friend. They sleep together every evening. Thank you again for raising up such a wonderful little kitten for us to bring into our family! You obviously enjoy what you do and it shows in your kittens. Terri proud owner of Katya! I'll try to remember to send you one of the photos tonight - they're on my home computer. We are absolutely IN LOVE with the kitten we got from you in February. We've named him Pasha (our little Siberian prince). I've had cats all my life and I've never had a cat that is more sweet, cuddly, curious, and just plain adorable!! He is so handsome and you're right - he really doesn't shed! My black clothes are now black again (and not covered in cat hair as they were with my other cat!). He keeps us in hysterics as he never seems to tire of playing with toys (he loves to hunt toys with feathers) and his the most amazing acrobat I've ever seen - he leaps and flies through the air (higher than I've ever seen a cat leap before) to catch his toys and leaves us staring eyes wide open and jaws on the ground!! His love of water has driven him to join whoever is in the shower any time the faucet is turned on - he also likes to go in and walk around whenever we get out, so it's not uncommon to find little wet paw prints around! I was shocked how quickly he warmed to us and became such an integral part of our lives. He follows us around from room-to-room and curls up with us everywhere... truly the sweetest little cat I've ever known!! We are considering getting another one of your kittens to keep Pasha company as your cats are so amazing, gentle, and kind. Thank you again for the opportunity to add such a special new member to our family. I am so sorry to those who have sent a testimony that is not posted. My computer crashed and I lost all the emails containing the testimonies. If you would like to resend them, I will be happy to make it my priority to post them. Thank you again for the time you have taken to write, and I apologize for not getting them posted right away.